Walking with the Lord is not always easy. There are some parts that seem to really “trip” us up and cause us to stumble away from God when we try to rationalize or alter what the Lord has said about the matter. Tithing is one of those parts. 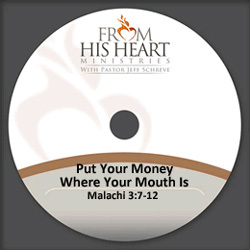 In this probing message from Pastor Jeff Schreve called PUT YOUR MONEY WHERE YOUR MOUTH IS, he explains what tithing is and why the Lord has set this system into place. Are you willing to trust God with your finances? This message is part of the 9-message series called GOD’S LAST WORD TO A LOST GENERATION.